Michael Brown Has Been WHITE-Washed? This post has been reposted here with permission and originally appeared at Churchwatch Central. We know that James White would not preach or tolerate a different Jesus, a different gospel or embrace a different spirit. So why is Dr James White coming out so strongly in public support of Dr Michael Brown? Trinity? Check: more so than 99% of all believers I know (see his Answers to Jewish Objections to Jesus 5 volume set). At this point I have to say, “That covers it–or at least it covered it for the Apostles.” Ah, but wait, someone says, that’s not nearly enough! We need to see if there are any contradictions in there! He’s a charismatic, so he can’t believe in Scriptural sufficiency, for example! I definitely see an issue there—and MB is not ignorant of it, and would reply that he does not believe in continuing *canonical* revelation and would make a distinction in regards to any modern “revelation” and the term “theopneustos.” Do I agree with these distinctions? Nope. Does that give me the right to overthrow the above affirmations? NO. But, he’s not Reformed! In fact, he claims to be a former Calvinist! That’s surely enough to banish him! If you think only Calvinists are going to heaven, I guess you could conclude that. I don’t, and as much as I believe we honor God by believing all of His truth *consistently,* I find nothing more repulsive than those who wrap themselves in their TRRs (Truly Reformed Robes) and look down on the unwashed masses of non-Reformed, sniff haughtily, and point a bony finger toward perdition and growl, “Off with you to the flames, you non-elect!” MB and I have set a standard, we hope, in honestly addressing these issues in the confines of brotherly commitment to the glory of Christ, the integrity of the gospel, and the inspiration of Scripture. But…he went on Benny Hinn’s show! Surely that is enough to cast anyone into hell! I wonder if folks think through such statements. I wish MB had not done that—I think maybe sometimes he wishes he had not done that either—but when you stand back and look at the list above and go, “Yep, all that—irrelevant—Hinn is enough,” doesn’t it follow that you just made Hinn more important than everything else in that list? Ever thought of that? Most haven’t. Unity is, in fact, based upon truth. But it is not based upon walking in lockstep with the narrow vision of one particular group or viewpoint. MB and I are going to be engaging some Black Hebrew Israelites in debate next year, Lord willing. I look forward to it. We might have some disagreements (we don’t view Israel in the same way). But since we will be debating the Trinity, the deity of Christ, etc., we will be on the very same page, just as we were when we were defending the deity of Christ against two unitarians a few years ago. Unlike certain folks, I’ve prayed with Michael L Brown, and I know his heart for the gospel and missions and our common Lord. So I will continue to debate with him in defense of the truth, and continue to debate him in the pursuit of unity based upon the inspired Scriptures we both love as well. So you believe he made a mistake with Benny Hinn, Dr White? What about false teachers like Lou Engle? C. Peter Wagner? Che Ahn? Bill Johnson? Cindy Jacobs? Rick Joyner? Jennifer LeClaire? Mike Bickle? Sid Roth? Jonathan Cahn? Heidi Baker? Dr Michael Brown might regret going on Benny Hinn but he doesn’t apologize for his ongoing relationships and endorsement of his friends listed above. These aren’t some old endorsements, these are very current validations of these false ministries. However it goes beyond the endorsements and relationships. We are now talking about dangerous theology. Dr Michael Brown has clearly demonstrated that the ‘false jesus, false gospel and false spirit’ he ministers from is the same ‘false jesus, false gospel and false spirit’ that’s peddled by the heretics he endorses! It’s not just these foundational categories – the theology of NAR Apostles like Michael Brown consistently and continually oppose core teachings of the Christian faith including ecclesiology, liturgiology, missiology, eschatology, basileology (study of the kingdom) and so on. 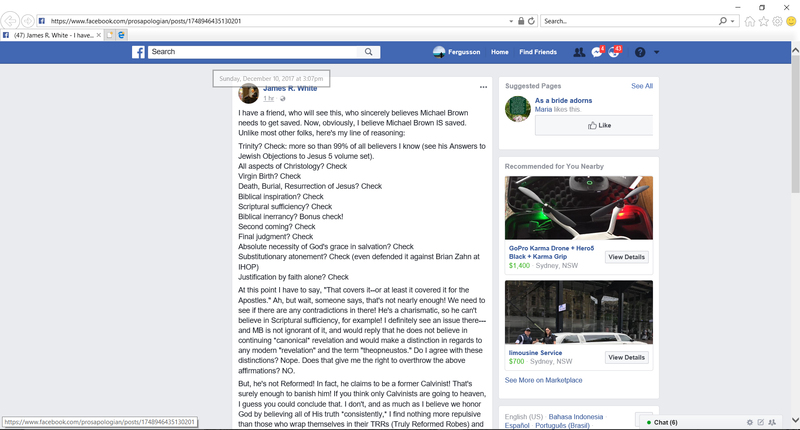 Let’s go through some of the check-list made by Dr White in his post and see if he really wants to embrace Michael Brown as a brother in Christ. Really Dr White? So do you. like Brown, deny that Jesus gave up His divinity to become fully man so you, just like Jesus, can do miracles under the power of the Holy Spirit? (This is the false kenotic Christ which Brown believes.) This is the false NAR Christ Michael Brown confesses, espousing the typical NAR cult-litany that comes with the territory. “Yet Jesus told us that if we believed in Him, we could do the same works He did (John 14:12). Why, then, is there such a massive discrepancy between what He did by the Spirit and what we do by the Spirit? As we’ve pointed out before, some of the demons Jesus encountered recognized the deity of Christ in human flesh. But Michael Brown and his NAR Apostle buddies do not. Dr White, people have their faith shipwrecked by this gospel. Just listen to Justin Peters to hear how this ‘gospel’ is no gospel at all and is nothing but a stench in the nostrils of Christ Himself. Is this the gospel James White REALLY wants to believe in? Of course not! This is the classic NAR gospel that goes by many names such as ”Gospel of the Kingdom’, ‘Power Gospel’, ‘Whole Gospel’, ‘Full Gospel’, etc. It’s this gospel that came out of the Latter Rain movement which then later created the Health and Wealth gospel and Word of Faith cults. Are you prepared to defend and die for this gospel James White? Of course not! This is just absurb on Dr White’s part. Cults, and even doomsday cults, can believe in the ‘second coming’ or a ‘final judgment’. The NAR is the biggest doomsday cult in the world today and was responsible for creating men like Jim Jones (Jones claimed to be an Apostle and a ‘little god’ who was changing the nation and operated in healing signs and wonders). Just like Jones, the NAR reinforces the belief that the church is ‘the hope of the world’ and acts as a saving/cleansing agent of the world’s sin before Christ’s return. “Times of great evil lie ahead. God’s army must be equipped and trained. Then it can come forth. Source: Dr Michael Brown, What Happened to the Power of God?, Destiny Image, Revival Press, Published 1991, pg. 161. Source: Dr Michael Brown, What Happened to the Power of God?, Destiny Image, Revival Press, Published 1991, pg. 185. Now we have people in the NAR claiming they are the New Breed – that they are little Gods/Christs who ‘only doing what they see the Father doing’. (Todd Bentley, Matt Sorger, Todd White). They espouse the belief that they are the ‘righteousness of God’ in human flesh. And this is simply ludicrous. If Michael Brown says he believes in the sufficiency of scripture, then James White will believe anything that man says. The best example is Brownsville. Although Dr Brown upholds it as a genuine move of the Holy Spirit – then how does Dr Brown accept the fact that the ‘infallible’ Apostle Yonggi Cho claimed that the Brownsville revival would never end until Christ would return? The point is Dr Brown is quite prepared to reject the bible as his authority and replace it with the authority of false apostles. Furthermore, the entire foundation of the NAR is built on very modern prophecies by William Branham, Frank Hall, Lorren Cunningham, Bill Bright, Bob Jones and many others. For instance, Cunningham gave the church the ‘Vision of the Waves’ and alongside Bright, ‘The Seven Mountain Mandate’. Bob Jones expanded Cunningham’s wave vision. With Jones’ background in Branham/Hall’s Latter Rain teaching, he claimed he received the ‘Billion Soul Harvest’ in 1975 by Jesus Christ Himself in heaven. Yet Dr Brown has never refuted these prophecies but instead has shown he believes in them while appearing to downplay that these apostles say they received these mandates from God Himself. That is a very clear example that Dr Brown does not hold to scripture alone but rather upholds the false ‘revelations’ of modern-day NARpostles and prophets. We have many recordings of Michael Brown espousing these heretical teachings. The fact that Dr Brown has no problem working with Lou Engle, Sid Roth, Cindy Jacobs, C. Peter Wagner and defending them puts him outside of the Christian faith. Upholding the foundation of their anti-Christian teachings and ministries suggests that Brown is destined to share with them the mighty wrath of the Lamb unless he repents. More disturbingly, Michael Brown is speaking the native language of Satan, the father of lies, and James White is putting up with Brown ‘easily enough’. The proof is not just in Brown’s teaching, it’s also revealed by his ongoing deception, with its potential of undermining the solid ministry of Dr James White. While the scriptures claim men like Brown are accursed for preaching a different gospel, Dr White seems to think it is alright to give his imprimatur to Brown thereby ‘White-washing’ his countless lies and false teachings. He is an end-times Apostle of the NAR. This man has done a great job attempting to deceive even the elect. It is time for James White to practice biblical discernment and not tolerate Brown who is the ‘Iago’ of Christianity. To James White, we know you don’t believe what Brown believes – but what you bring with this endorsement of Michael Brown is Michael Brown’s endorsement of some of the worst false teachers in Christian history. And we do not wish to bring your name down – in your endorsement of Brown today on Dec 9, 2017. White, you are in danger of making the body of Christ question your ability to discern and be a voice of reason in the field of Christian apologetics. Ann Voskamp's Dangerous View of God's Love. Previous story Theologian Calls out Gospel Coalition/ Joe Carter for Hypocrisy on Attacking Roy Moore But Celebrating MLK Jr.